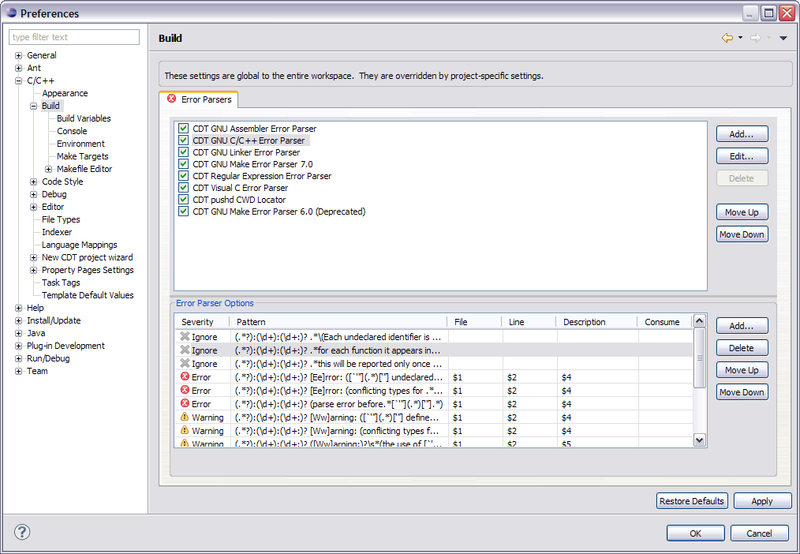 Use the Error Parsers Tab on Build preference panel to define global error parsing options. Error Parsers scan build output looking for potential error or warning messages. They create Problem Markers which help to visualize problems for users. Most of Error Parsers scan build output line by line and check if the line match a certain pattern. This preference page lets define those patterns. Error Parsers Lists the available error parsers and the order in which they are called. Click Add... to add additional parsers. Click Edit... to show the Error Parser Options list if applicable. Click Delete to remove a parser. Click Move Up to move a parser earlier in the call order. Click Move Down to remove a parser later in the call order. Error Parser Options Lists the patterns used by the selected error parser and the order in which they are called. Click Add... to add a new pattern to the list. Click Delete to remove a pattern. Click Move Up to move a pattern earlier in the call order. Click Move Down to remove a pattern later in the call order. Click a pattern to select it for editing. Ignore - use this option to suppress generating a marker. Pattern Java regular expression pattern. This pattern should define groups in parentheses for using in File, Line, and Description fields. The pattern is assumed to start from the beginning of line and end at the end, so it is unnecessary to specify starting "^" or ending "$" in the pattern. File Define a file which will be associated with the problem marker. This is a replacement pattern. Use $ notation to refer to one of the the groups defined in Pattern, i.e. $1, $2,$3 etc. Line Define a line in the file which will be associated with the problem marker. This is a replacement pattern like for File field. Description Define a description which will be assigned to the problem marker. Consume This field defines if the pattern stops processing of output line (consumes it). By default it does (field is empty). Use No if the same line needs to be processed by several patterns.